Gray Eagle Lodge is a beautiful retreat from a busy world full of devices and hectic schedules. It is located in Plumas National Forest, just outside a town called Sierraville, California, and has a special permission permit to operate within the Forest boundaries. The massive Lodge that is standing today, was constructed in the 1980’s and is currently run by Lynn and Bret Smith. The open season is from Memorial Day weekend to mid-October each year. This resort is perfect for those looking unwind, and get back to nature without missing out on the comforts of home. Breakfast and dinner are included in the rates, taking the work of finding a place to eat out of the equation. 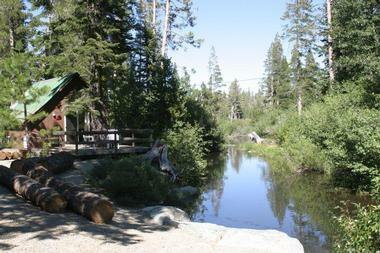 There are 20 cabins located throughout the property along Lakes Basin as well as two lodge guest rooms. Gray Eagle Lodge is the perfect destination for couples, families, groups and singles alike. There truly is something for everyone to enjoy. The 20 cabins located on the lodge property are all differing in size and layout, making it easy for everyone to find a cabin to suit their exact needs for a vacation. The cabins can accommodate from two to six guests depending which cottage is selected. All cabins come with a private, full bathroom, and one, the Maple, has a second bathroom as well. Guests will enjoy the outdoor decks or patios attached to each cabin to enjoy views of the forestry and meadows or Graeagle Creek. Each cabin is equipped with a small refrigerator for guests use, as well as comfortable seating for relaxing indoors and out. In the Lodge, guests have access to free Wi-Fi usage. If guests prefer to get the outdoors experience, there is the Aspen or Spruce cabin which both have an optional outdoor tent available from mid-June to Labor Day weekend that is set up on the deck and contains two twin beds. Guests will have all the fun of outdoor camping, with the comfort of a real bed. Daily housekeeping is included with each stay. What is guests will truly love about their stay on the Gray Eagle Lodge property, the cabins are well spaced out to provide guests with the utmost privacy while still maintaining safety for guests while in the forest. The Lodge itself features two separate suites, the Heather and the Manzanita, which have a shared private entrance to a stairwell leading to the suites. Inside each room there is a queen size bed, a bunk bed, full bathroom, and a refrigerator. They each feature their own balcony overlooking the grounds of the Lodge. While pets are allowed in the cabins at Gray Eagle Lodge, there are no pets allowed in the Lodge suites. Since breakfast and dinner are included with each guests stay, there is no need to seek out places to dine while staying at Gray Eagle Lodge. The Firewoods Restaurant takes guests back in time to Lake Tahoe 1950, with its log style walls and cottage décor to create a real outdoors atmosphere. Chef Lynn Hagen works to create delightful menus for guests to feel satisfied and enjoy their dining experience. The breakfast menu consists of a choice of one of the following: two eggs, bacon or sausage and breakfast potatoes, oatmeal, fruit plate, daily omelet, and pancakes or waffles (depending upon availability each day). The breakfast bar also has a selection of toast, cereal and milk. Coffee, tea and juice is available throughout breakfast and one breakfast meal per person is included for guests. 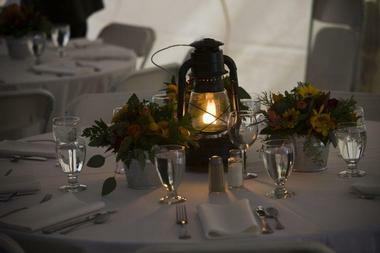 Dinner is also included with each person’s stay at Gray Eagle Lodge. Dinner consists of three courses and guests have a choice of their meal to some extent. Each entrée includes salad or soup, homemade bread, seasonal vegetables and potatoes plus a choice from the delectable dessert menu. Each night of the week the restaurant has a feature entrée to choose if guests wish. For example, guests can try the New York Steak on Tuesdays or Bacon Wrapped Meatloaf on Friday. There are also Chef’s Daily Specials including a fish, a chicken, a beef, a pasta and a vegetarian special which changes nightly. The Children’s Menu is for anyone 12 and under and has a selection of kid’s favorites including desserts. One dinner per person is included each night of guests’ visit. If guests wish to invite friends or family for dinner, outside guests are welcome for dinner and pricing ranges from $19.99 to $34.99. Lunch is available for an additional charge and can be pre-order the night before. It will be ready for pick up at the Lodge bar by 8 a.m. This is perfect for those days on the go. There is a selection of sandwiches which include lettuce and tomato plus chips. Guests can also choose an apple or cookie plus a beverage. At Gray Eagle Lodge, guests can sit back and enjoy a beverage on the patio just outside the Firewoods Restaurant which overlooks the grounds. This is perfect place for parents to sit and watch the kids play volleyball or lawn bowling while sipping a beverage. The Lodge Bar features an expansive list of cocktails to choose from as well as wine by the glass and bottle. Many local ales are available to sample and enjoy as well as brew favorites both domestic and imported. Drinks can also be ordered during dinner but are not included with the meal plan, they are an additional charge. The wine cellar is ever changing at the Lodge and boasts fun and unusual wines from around the country. Wine enthusiasts will love sampling the many varieties. There is a $15 corkage fee should guests bring their own bottle. Gray Eagle Lodge is the perfect destination for families and children. It offers the opportunity to unplug, unwind and enjoy spending time together in a wilderness, outdoors setting. 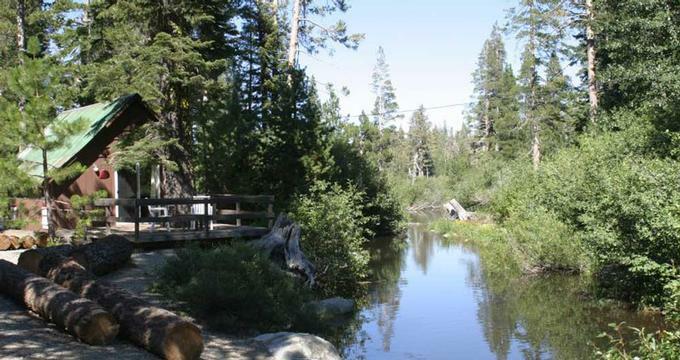 The kids will love the hiking trails, complete with USFS markers and placards, or fishing in the creek where they may hook on to a Rainbow Trout. The Graeagle Creek Waterfall is a mesmerizing sight for everyone and children will love swimming in the natural swim hole just below in the waterfall. Kids will love the nightly bonfires and S’mores made on the fire and an exciting game of flashlight tag with guests of the entire Lodge. Throughout the season there are Biology Classes held for children to participate in which includes nets, boots and microscopes for use during the stream biology class. Families can rent bicycles, kayaks and peddle boats for added fun. The Willow Cabin is the best choice for large families visiting Gray Eagle Lodge. It features a king bedroom, a second bedroom with two twins and a queen size sofa sleeper in the living room. There is a refrigerator, a full bathroom and a private, large deck to enjoy the scenery and outdoors. There is a table and chairs for family game nights or quick lunches in the comfort of the cabin. Weddings at Gray Eagle Lodge are breathtaking and unforgettable with the incredible scenery and outdoor spaces. Guests will love the rustic, yet elegant Lodge which has a majestic stone fireplace, a perfect backdrop for family photos. Small intimate weddings or wedding with up to 125 guests can be accommodated. Graeagle Creek Falls also make a magical backdrop for any outdoor ceremony. The Bride and Groom will have access to a personal chef for their special day to ensure their reception meal is all they desire. Conferences or Group meetings are always welcome at the Lodge. From team building activities, to group golf retreats or private cocktail parties, the Lodge is happy to help plan guests next event. If additional space is required, individual cabins may be reserved and used as break out rooms. Golf lovers will be pleasantly surprised by the number of courses in the nearby area. Whitehawk Ranch, Graeagle Meadows, Plumas Pines and Grizzly Ranch are alpine courses which are minutes from the Lodge, allowing guests quick and easy access to a game or two of golf during their visit. There is golf at every level to offer a fun challenge to everyone. Also very close by is a driving range, a mini golf course and two nine hole golf courses for a quick game or two. 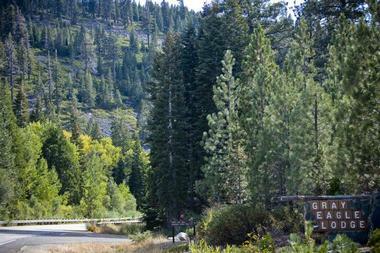 The natural surroundings of Gray Eagle Lodge mean guests should take care to preserve the local area while visiting. At Gray Eagle Lodge dogs are welcome as members of the family for an additional $25/night fee and a limit of two dogs per cabin. There are extensive trails for off leash walks and nature for pets to enjoy. Dogs must be on leash on the Lodge grounds. Located a short distance away, guests can explore the quaint shops in Graeagle. There are local breweries to tour as well as wine and olive oil sampling. The Lodge hosts are always happy to give more information about local attractions, activities and events. Back to: Best Lake Vacation Spots in North America.